For your hands and body. Lather up with our cleansing, yet moisturizing, organic liquid soap. Can also use as a shampoo. Gentle enough for a baby shampoo. 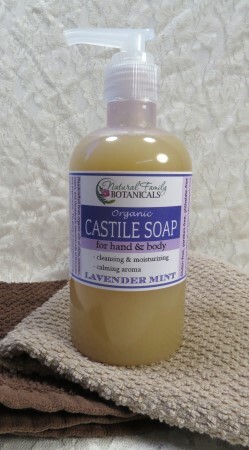 Has a soothing aroma of pure lavender and peppermint essential oil. Saponified organic olive oil, organic coconut oil, organic castor oil, pure essential oils.